The Arc'teryx Nozone, a thirty-five-liter backpack, has become my go-to alpine climbing pack because it incorporates climbing-specific details into a remarkably simple and durable form: a body, a removable "brain" (top lid), shoulder belts, a removable webbing hip belt, four side compression straps—and that's about it. The ultra-tough 420D impregnated nylon holds up to abrasion on rock and sheds precipitation better than standard polyurethane-coated nylon. The wide, but thinly padded shoulder straps are equipped with load lifters and an expanding sternum strap. This unique design, which Arc'teryx employs on their harnesses, distributes weight evenly and is actually more comfortable than more thickly padded straps, which can create uneven pressure. An ample brain holds about two liters, easily stowing food, headlamps, GPS, etc, and can be removed if desired. A simple strap across the top holds a rope in place, and compression straps on the sides allow a pad, tent or skis to be carried easily. A simple hip belt of flat webbing does is not intended to bear weight, but functions well to secure the load to your back while the shoulder straps distribute weight, comfortably carrying up to thirty-five pounds. A small mesh pocket on one side helps secure slender items like pickets or trekking poles. Elastic straps across the back are the perfect size for securing crampons, which can be backed up with a carabiner to low-profile clip points. This backpack was obviously built by people who spend time climbing. A climber will appreciate simple design choices that make routine tasks easier; for example, the brain's zipper is on top rather than at the junction with the pack'sbody. After years of delicately unzipping these pockets at hanging belays, ready to catch the watch or gel packet about to fall into the abyss, I appreciate the ease of simply unzipping the pocket with no danger of dropping things. The drawcord closure on the top of the main body compartment is equipped with a neon pull cord that's ridiculously fast and easy to open and close, even when wearing gloves. Sometimes when I'm on the go, I just flip the brain into the body and cinch the cord shut. Also, the high hip belt sits naturally above a harness, allowing the option of securing the pack with the hip belt while climbing and still having access to critical gear loops, while the brain sits low enough to leave room for your head while looking up. The Nozone's simplicity comes at a cost to some common features. There is no hydration pouch. I don't find this to be a problem—I just make sure sharp objects are tucked away from my water bladder. The Arc'on suspension system incorporates two aluminum stays into a back of high-density foam. I haven't used the stays in months, and the pack carries fine even when loaded heavy. The foam is not removable—some people like the "bivy pad" option—but it's sure nice if an ice screw or cam lobe gets lodged against your back. My only disappointment is the p'ax ice holder system on the rear panel. It allows you to remove a tool one-handed while the pack is on, but it's integrated into the compression straps in such a way that if the pack isn't full, an ice tool can bounce around in a manner that I found less than confidence inspiring. I actually stitched two pieces of webbing to my Nozone to replicate the ice-tool attachment on the old Black Diamond packs—a system that I think works better. 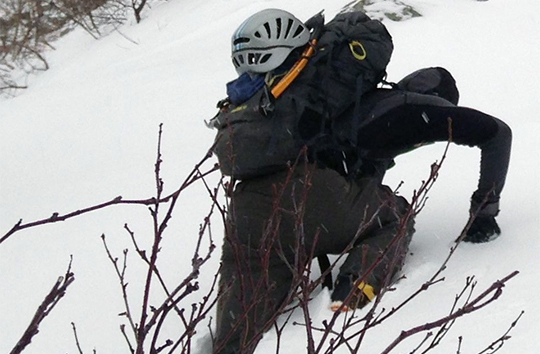 With my DIY ice-tool fix, the Nozone pack performs perfectly in the mountains. It carries five pounds of summer gear on the Diamond or thirty-five pounds of ice gear and bivy kit in Patagonia equally well; in fact while climbing or skiing, I don't even notice it's on. Great review, only one problem, Arc'Teryx discontinued this pack nearly a year ago. In fact this pack was the first to go of the NoZone line; nearly a month and a half ago the 55 and 75 went on clearance and Arc'Teryx removed them from their site. For all intents and purposes the NoZone line ceases to exist. While informative this review doesn't do anyone that reads this magazine any good because of how ridiculously out of date it is. Unless this is a clever ploy by Alpinist magazine to push Arc'Teryx in bringing back the NoZone line (something I hope they do because my BD packs aren't as nice as my NoZone 55) this review shouldn't have been posted.